Balancing Chakras Day 7 - The Crown Chakra - Amphora Aromatics Ltd – Supplier of pure essential oils and aromatherapy Products. We’ve reached part 7 of our introductory guide to the best essential oils to use when balancing the chakras. This final part looks at the Crown Chakra – click to read more. Yoga pose: Supported head stand, the Plow and Lotus poses. The crown chakra is linked to our sense of enlightenment and consciousness. 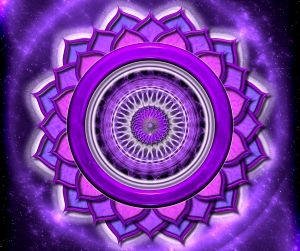 Through this chakra we can reach higher levels of awareness and connect with higher energies. Physically it is linked to our nervous system, brain and pineal gland (the gland in our brains which controls the release of melatonin). When it is off balance we may suffer symptoms associated with these areas. To keep the crown chakra in balance means to achieve acceptance of the self, to be without ego, more joyful and feel a higher sense of purpose in life. When this chakra is off balance, we are likely to feel a lack of purpose both spiritually and in everyday life. We may feel confused, restless and struggle to make decisions in life. This may result in feelings of frustration, boredom and a lack of joy in life. Frankincense – Thought to help open up the crown chakra allowing us to connect spiritually to other energies. The calming properties of this well-loved oil can help treat symptoms of chakra imbalance such as nervousness and anxiety. Frankincense is a wonderful oil to help relax the mind and center thoughts. This can help us to achieve a higher meditative state and visualize positive thoughts. Meditation can offer invaluable help for overcoming symptoms of depression associated with an imbalanced crown chakra. Benzoin – Incredibly uplifting for the mind, Benzoin can help combat negative thoughts and bouts of depression. This can assist you to become more open and aware of higher energies and help you to feel a higher sense of purpose and spirituality. Spikenard – considered to be a highly spiritual oil, Spikenard was used in ancient Egyptian times for meditation practices. It’s a gentle sedative which makes it effective in helping to maintain balance both psychologically and physically. Used in vapor therapy, Spikenard can be used for helping heal emotional anxieties and overcome those negative emotions which can knock the crown chakra off balance. To use essential oils in healing the crown chakra, you can dilute in a carrier oil and apply via massage directly to the crown. Aim for a 3% blend – 3 drops of essential oil to every 5mls of carrier oil. 3 drops Benzoin, 2 drops Frankincense and 1 drop Sandalwood. Thank you for reading – hope you’ve enjoyed our series on balancing the chakras. My thanks go to my colleague Lucy who has been invaluable in researching and helping to compile these blogs. To see our other blogs including the previous 6 entries in the chakra series just click here.